Los Angeles, CA – Shout! 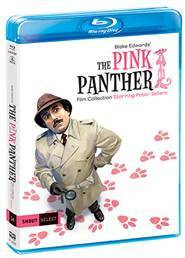 Factory has announced an exciting new 6-disc Blu-ray set, Blake Edwards’ The Pink Panther Film Collection Starring Peter Sellers. Available June 27 as part of the Shout Select line, this is the definitive, must-own complete set of the classic movie comedies that has been in demand by fans for decades. It is available for pre-order now at Amazon.com and ShoutFactory.com. The legendary Peter Sellers stars as the irrepressible and incompetent Inspector Jacques Clouseau in this 6-film collection, which includes The Pink Panther (1964), A Shot In The Dark (1964), The Return of the Pink Panther (1975), The Pink Panther Strikes Again (1976), Revenge of the Pink Panther (1978), and Trail of the Pink Panther (1982), each directed by Academy Award winner Blake Edwards (Victor/Victoria, Breakfast at Tiffany’s). For the first time in any home entertainment issue, all six Clouseau comedies are available together in a single collection, with four making their debuts on Blu-ray. The spectacular set comes with a 24-page book with an essay by animation historian and film critic Jerry Beck. Bonus Features will include new interviews with cast and crew members, audio commentaries, rare theatrical trailers, TV spots, stills galleries, and more. Audiences adored the bumbling detective, and a phenomenon was born. The movies showcase a magical combination of Blake Edwards’ masterful directing, writing, and producing skills; Peter Sellers’ hilarious verbal and physical antics as Clouseau; sparkling performances from, among others, series staples Herbert Lom, Burt Kwouk, André Maranne, and Graham Stark; Academy Award winner Henry Mancini’s sophisticated and slinky musical scores; and glorious animated opening and closing credits starring that fantastic feline – the Pink Panther.